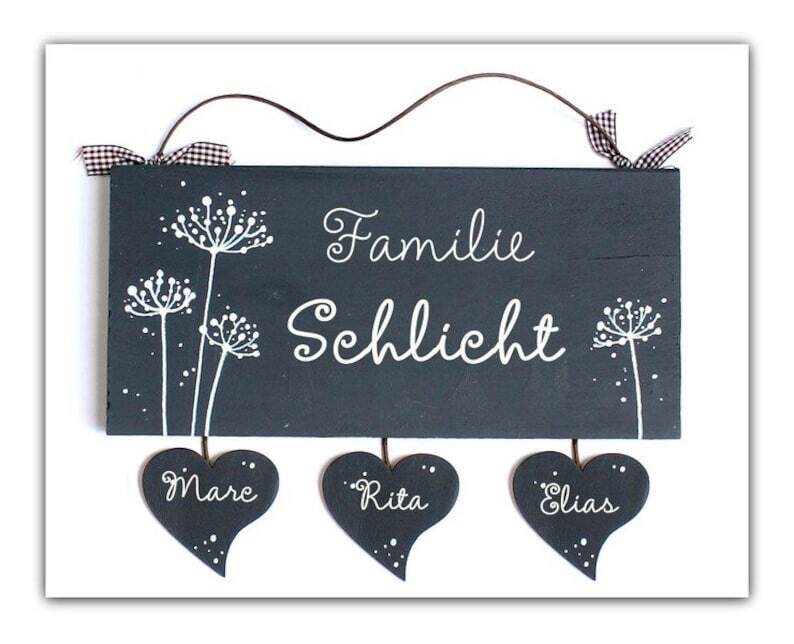 Door sign wood, name tag, family sign, wooden sign hand painted/labeled. Slate grey primed and hand painted-the design and the lettering in white-looks great! Here we can assemble up to 5 heart pendants next to each other. We are also happy to base them in other background colours such as light grey, Lind and dark green, dark blue, Bordeaux, black etc. A message about this is sufficient for the purchase. Select table for the fonts can be found in the product photos! Up to 5 heart pendants can be mounted on this door sign. We are also happy to design wildcards if the family planning is not yet complete. For example: Family current to four, montage of 5 Hearts: Papaname-mamaname-daughter name-&-Sonname. In position 4, a heart is labeled with A & sign. This heart can then be replaced later by another heart. However, individual hearts can also be ordered and found in our shop department "accessories". Placeholder hearts can also be painted with symbols for luck or love, i.e. clover, horseshoes, Hearts, Sun, star, flowers etc. Also conceivable would be sun-papaname-Mamaname-sonname-Sun. The possibilities are almost unlimited. The signs are hand-made from the front to the back-this makes us flexible-but also means that small deviations in the paint and colouring are possible. But it's supposed to be a single piece! The best possible protection against atmospheric influences! This motif is also available on slate. To be found here in the shop. From now on, our designs are protected throughout the EU by design according to NGGM against imitation of any kind. This also applies to the partial representation/imitation! Vielen Dank für die schnelle Lieferung und die tolle Ware! Ein schönes persönliches Geschenk! Vielen Dank!